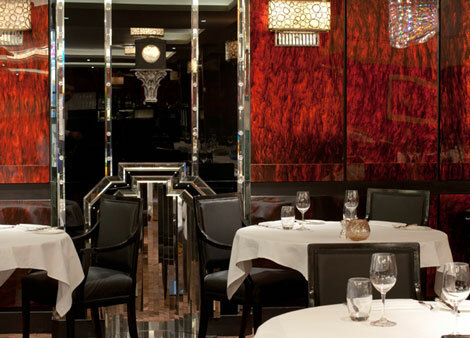 The Savoy Grill has reopened this lunchtime as a Gordon Ramsay restaurant, under Chef Patron Simon Gillies and head chef Andy Cook, with Gordon Ramsay meeting and greeting guests for the opening lunch. Business Traveller was there for a light (two-course lunch) with a table for two, quite close to the door, but with an excellent view of the room. Reassuringly no celebrities were present, and despite a few hiccups from the kitchen, including a slightly delayed main course, the service, ambience and food was excellent under restaurant manager David Carter. The new design certainly is an evolution rather than a revolution with the Russell Sage Studio designers preserving much of the room’s original table plan. Probably the most noticeable design features are the elegant chandeliers and the panelling of (real) gold leaf backed tortoise shell Lucite. On entrance the tables immediately by the right hand wall have been removed and there is a small bar, but the layout of the room will be immediately recognisable to anyone who dined at the Grill a few years ago under fellow Gordon Ramsay protégé (though now they’ve fallen out) Marcus Wareing. The restaurant dates back to 1889 and has had everyone from Sir Winston Churchill and Oscar Wilde to Frank Sinatra and Marilyn Monroe as diners. The menu, which can be viewed here, certainly seemed well chosen, with plenty of hale and hearty options to fight the current chill, and a pricing which surely reflects an awareness not only of the current economic climate, but the potential media backlash for overpriced produce. Starters ranged from £6.50-£16.50 (although you could have Oscietra caviar with blinis and crème fraîche for £85 (30g) or £140 (50g). Upstairs after lunch we were given a quick tour of the former Banquette restaurant which is now the private dining room, named D’Oyly Carte in recognition of the view across the famous courtyard complete with swan fountain to the art deco Savoy Theatre, built by Richard D’Oyly Carte to showcase Gilbert and Sullivan operettas. 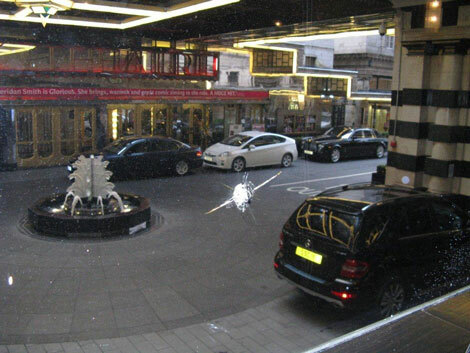 Although tens of millions has been spent on the restoration of the hotel, it’s good to see they have kept the bullet hole in the window upstairs, which I have variously been told was as a result of a failed robbery, or dating from some war time incident.